CHICAGO— State Senator Bill Cunningham joined the University of Illinois in announcing a new performance and accountability initiative that will ensure full funding for the university and help hold the line on tuition increases. The plan would provide the university with stable funding and some regulatory relief in exchange for meeting specific standards on student access and achievement. Some examples of standards include in-state enrollment requirements and benchmarks on graduation rates, financial aid and tuition. 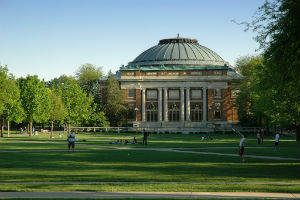 The plan was announced at the University of Illinois’ Board of Trustees meeting in Chicago on Thursday. 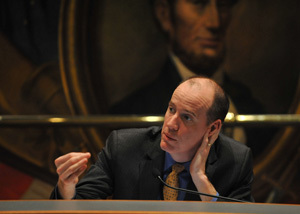 Cunningham will serve as the chief senate sponsor on the initiative. SPRINGFIELD—Higher education administrators will no longer be able to claim country club memberships as a part of their pensionable income thanks to a proposal pushed by Senator Bill Cunningham becoming law today. 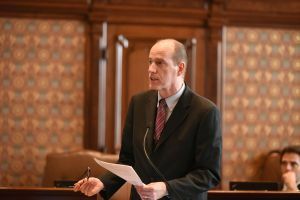 Senate Bill 2156 was one several new laws authored by Cunningham this year aimed at limiting perks for public college and university presidents in Illinois. The legislation was sparked by a scandal at the College of DuPage, where the president received a $750,000 severance package just to leave the college. CHICAGO—Hair dressers and nail technicians throughout Illinois will now be trained to detect signs of domestic violence or sexual assault and help the victims thanks to legislation sponsored by Senator Bill Cunningham that was signed into law on Friday. "My wife used to work as a hair dresser and she frequently heard stories from her clients who were victims of domestic violence," Cunningham said. "Unfortunately, she didn't have the knowledge or resources needed to help them. This new law will ensure that hair dressers will be trained to assist their clients who reach out to them for help." House Bill 4264 would require that cosmetologists, estheticians, nail technicians and hair braiders take a one-hour continuing education class about domestic violence and sexual assault awareness. 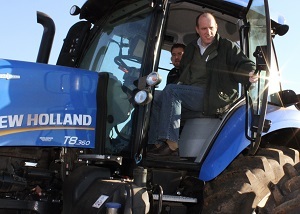 The class would also provide them with resources to give to their clients.